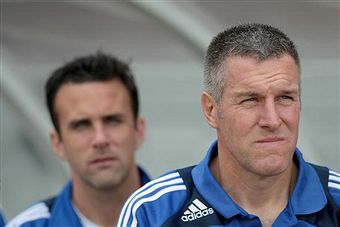 I guess Peter Vermes liked coaching enough after all. Today the Kansas City Wizards are set to remove the interim tag from Vermes title and name him their full time head coach. The Wizards will formally announce Vermes as the club’s head coach at a press conference later today at the Wizards Swope Park Training Complex. No word yet if Vermes will keep his other position as the team’s technical director. The Wizards posted a 3-6-3 record under Vermes, but did close out the year going 3-3-3 in their final nine matches. Seeing Kansas City lock up their coaching issues should put some pressure on Toronto, DC and New York to do the same in a matter of time. New York may take the longest of the three as they are still trying to figure out some other things before they hire a new coach. I do like that KC decided to make this move before the expansion draft but still I don’t know if Vermes is the right guy for the job. He’s been with this club for three years now as their TD and to be honest we haven’t seen this club progress all that much with him as TD. He needs to act quickly in getting some fresh talent to this roster to get things going in the right direction. I'll give him one year. No Playoffs in 2010 = Fire Vermes. He seems too mean to be a head coach…just like SH in Dallas…it's going to year 4, 5 years to get a whole team that accepts his demeanor, that is time he doesn't have.